The weather was my idea of perfect yesterday. It was in the low to mid 70sF, a bit overcast (I dislike lots of sunlight), and with a light to moderate breeze. So we decided to go canoeing again. After a few mishaps loading the canoe, we were off to Lake Nockamixon. Here's what we saw. We saw turtles and fish and turkey vultures and a kingfisher. I was just playing an audio of the call of the kingfisher to make sure I had the identification right. I never got to see the bird clearly, I just thought from the way it flew and the call that must be what it was. Turtle, our cat, was interested in the call, too, and apparently thought I'd brought one home. We also saw this little blue heron fishing along the bank. He was braver than the great blue heron we saw last time. He let us get fairly close and never flew away. 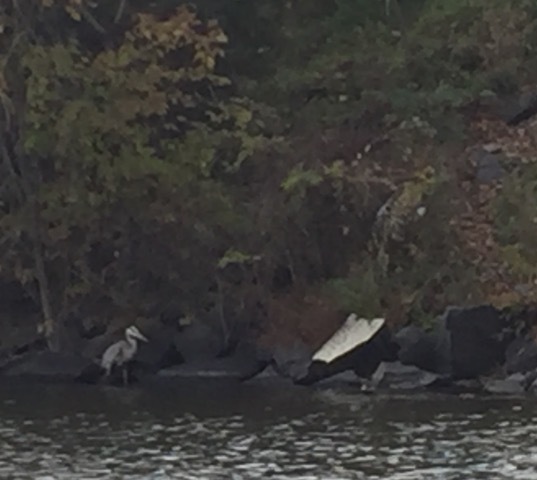 All these photos were taken with the same iPhone, but the heron one looks weird to me, almost like a painting. I wonder if Jack took it through the plastic bag he had his phone in. Labels: Canoeing, Lake Nockamixon, little blue heron. For my birthday in 1998, Jack bought me a canoe. We lived in Massachusetts, in a fairly rural area south of Boston known as the South Shore. We lived in a 300-year-old house with five fireplaces, situated about ten feet from the South River, when it was just a baby. More a stream there than a river. I was a conservation commissioner in our town, so I got out and about to conservation lands and lands that were to be protected. We loved to go canoeing, to rent a canoe on the Charles River, the Concord, the North River, and the South River. But since we moved to Philadelphia, I've had to store my canoe at my niece's in Sleepy Hollow, NY, and then at another niece's in Bucks County. We also no longer had our Land Rover D90, the kind of country workhorse that could easily carry a 16' canoe or plow through 4' of snow. And in PA, you have to buy a launch permit for non-motorized boats to legally put in at any state parks. However, we finally found a roof rack that would fit our small car, bought a launch permit, and headed off to Lake Nockamixon, about 15 minutes from my niece's farm. Autumn is the perfect time to canoe. Mid week means fewer people. Lake Nockamixon is huge, about 5, 200 acres. No boats with motors greater than 20 hp are allowed, although we were rocked a bit by the wake from a motor boat. Even small motors can create wake. The day was perfect. I was nervous at first because I can't swim. My family's thinking was that if you stay out of the water, you won't drown. My father could swim but my mother could not. My sister can swim. So I guess we split down the middle. I always were my PFD (Personal Floatation Device) and Jack used to be a lifeguard, so I feel reasonably safe. But I'm still afraid of all the lake monsters that live where you can't see them. And, so far, I'm only willing to paddle along the shore. The leaves were turning, the fish were leaping, damselflies were flitting, and a great blue heron flew from a tree, screaming at us for invading its space. It was peaceful and magical. Stress drained away. I read So Big, by Edna Ferber, two years ago and really liked it. Novels of the 1920s often have a quiet but compelling grace. No fireworks, no violence just to get our blood pressure skyrocketing, not a lot of whining or self analyzing. They're about life as many people knew it, hard and relentless. The people are accepting of their lot or, if not, are willing to work hard to change it. There's little sense of entitlement, as in many stories of today. This year, I read Show Boat, by the same author. I'd include a photo but my copy is a 3-in-one volume of no particular beauty and without a dust jacket. It's got So Big, Show Boat, and Cimarron in it. Show Boat is mostly the story of Magnolia (Nola) Ravenal, nee Hawks. Her father, Captain Andy Hawks, is a feisty little river boat captain, owner of the show boat Cotton Blossom. He knows every inch of the Mississippi and her tributaries, he knows the moods of the river. It's a living thing to him and the other rivermen. He takes the boat, its crew, and its cast of actors up and down the rivers, stopping in river towns to regale the townspeople and the backwoods people with plays and music. It's a real treat for them. They save their money and drive or walk miles to attend the show. Captain Hawks meets a New England school teacher named Parthenia. She is stern and unyielding and thinks plays and acting and dancing and music are sinful and a waste of good time. But Andy shows her the boat and tells her how profitable it is. She eventually comes around and takes over much of the management of the boat - to the annoyance of the crew and cast. She's the queen of the Cotton Blossom. Magnolia is born, becomes an actress on the boat, to her mother's dismay, and elopes with the dashing Gaylord Ravenal, hired as an actor but really a professional gambler. Gay and Parthy do not get along and he and Nola leave the boat. Their life is a pendulum swinging from riches to poverty, depending on Gay's luck at the card table. Nola wants stability for their daughter, Kim, born on the riverboat during a terrible storm. Kim goes to a convent boarding school and becomes a famous actress. I didn't get too involved with the story until I got close to the end. In my opinion, a lot of the book is flat, like someone relating facts and stories without a lot of emotion. It didn't keep my interest like So Big did, but I don't feel that I wasted my time reading it. I'm curious to find out what Cimarron is like. It's been a chaotic few weeks. I've been reading, but I haven't felt like posting because very few cheerful things have been happening. Our business computer crashed and burned (as did my husband). We had to buy a new desk computer and have our brilliant computer guy, one-arm-Brian, spend the day recovering lost data. A few days later, our backup program went into action restoring files we had already restored and deleting new data. Brian came back, gave them a good whacking, and straightened out the problem. I think we lost only two files. In addition, my step-daughter is now in week three in the ICU, recovering from major surgery. I have one thing to say to any smokers reading this: STOP! You don't want to go through what she's going through. We did have a lovely lunch at Great Sage in Clarksville, MD, a very busy vegan restaurant with delicious food. And, on the same trip to visit my step-daugher at Johns Hopkins, I got to stop at Daedalus Books in Columbia, MD. I've mail-ordered from them for years but had never visited, despite driving past several times. I was so overwhelmed that I only bought four books, two of them for my little grandnieces, a mystery for me, and an adult coloring book for me about Paris. For those days when all I can do is sit quietly and color in my coloring book. How's that for diversity, with a heavy lean on mystery? I've blogged about some of the books but not others. That doesn't mean that I didn't like them, I just didn't have a lot to say about them. Or they were finished while in the midst of the above referenced chaos. I started two mysteries and abandoned them. If they don't grab me fast, I'm not staying. I hope you had a good September.